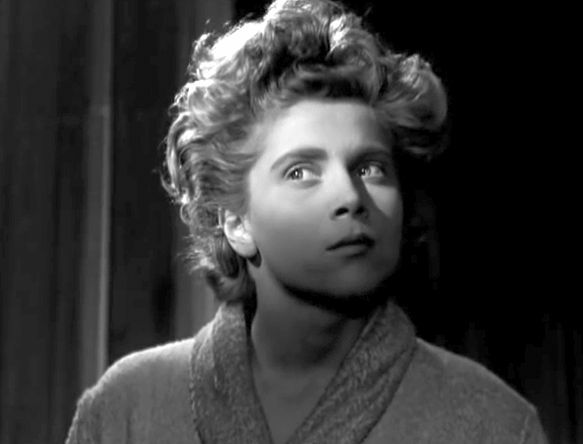 Jean-Pierre Melville’s second feature film, Les Enfants Terribles (1950), came well before his dazzling string of films noir that established him as that genre’s consummate master. In addition, despite Melville’s consciously developed auteur status, this film’s auteurship is often principally credited to co-scriptwriter Jean Cocteau. Perhaps because of these considerations, Les Enfants Terribles is often set aside from Melville’s other work and not listed as one of his masterpieces. This I think is a mistake, and I believe the critical arguments concerning over who was the major contributor and whether this film was specifically an early herald of the French New Wave are only distracting . 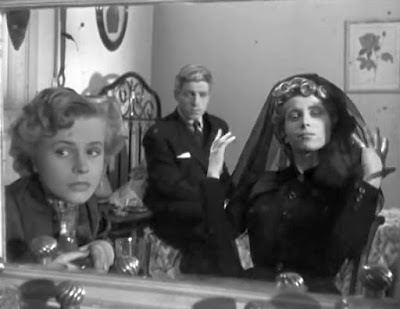 Of course it is natural to attribute principal authorship to Cocteau, since the film’s story is based on his sensational novel, Les Enfants Terribles (1929), that was a landmark for the early 20th century French avant-garde. But Melville’s unique stylistic contributions were undoubtedly crucial to the film’s entrancing appeal . Cocteau, whose work spanned a range of arts including writing, design, art, and filmmaking, was a superstar in French culture. He seemed to have had close relations with all the major cultural figures during the first half of the 20th century . And his flamboyant lifestyle added to his already considerable notoriety. Evidently after seeing Melville’s first feature film, Le Silence de la Mer (1949), Cocteau decided to invite Melville to make a film out of his own famous novel rather than direct the work, himself. It was a good decision. Melville’s moody, expressionistic mise-en-scene blended well with Cocteau’s more abstract and outrageous declarations in his story. The subject matter of Les Enfants Terribles concerns two young Parisian siblings who live alone and have mostly withdrawn from the world around them into their own private dreamworld. Some people may dismiss the whole tale as a depiction of two narcissistic misfits whose self-obsessions are unworthy of our attention. But there are aspects of this story and the way it is presented that have wider connotations and perspectives; and they draw us in. For one thing, the story concerns how people, but especially young people, form their understandings of themselves by imagining the roles they might play in social narratives. The principal character, Elisabeth, wants to embed herself in fantastic, self-constructed dramatic narratives in which she is a major protagonist. Her constant collaborator in these little psychodramas is her younger brother, Paul. So Elisabeth and Paul prefer their dramatic pseudo-narratives over the humdrum narratives of the external world, because they offer them more dramatic roles to play. Love – this can be expressed when one is open and unguarded, when one is willing to expose one’s inner self. But this can only be expressed if the feeling is not a forbidden love, i.e. a love that is not acceptable to the society at large. Hate – this can be expressed by the fearful and guarded. Both Elisabeth and Paul have forbidden loves, and so they confine their mini-stories, which they call instances of “the game”, to those of resentment and hate. In truth, the feeling of love is a new and astonishing emotion for all young people, and they probably experience the feeling of forbidden loves much more often than our public society is willing to acknowledge. In Les Enfants Terribles, there are five principal characters, and they all have feelings of love that they are reluctant to express. Elisabeth (played by Nicole Stéphane) is the older sibling. She has an incestuous passion for her younger brother, Paul. Paul (Edouard Dermithe), Elisabeth’s brother, has a homosexual passion for his schoolmate Dargelos. Dargelos (Renée Cosima), Paul’s androgynous and ruthless friend, may have unexpressed feelings for Paul. Agathe (Renée Cosima), Elisabeth’s friend, has a secret passion for Paul. Gerard (Jacques Bernard) has an unexpressed love for Elisabeth. Forbidden love was a subject very much on the table for the makers of this film, too. Cocteau was a flamboyant bisexual: Dargelos was the name of one of Cocteau’s boyhood passions, and the name frequently appears in Cocteau’s works. Edouard Dermithe was Cocteau’s lover at the time of this film’s making . Nicole Stéphane had affairs with women. And Melville always had an ambiguous profile in this area, as well. The story of Les Enfants Terribles moves through thee major acts. In the opening scene, there is a schoolyard snowball fight in which Paul is seriously injured by a snowball thrown at him by Dargelos. 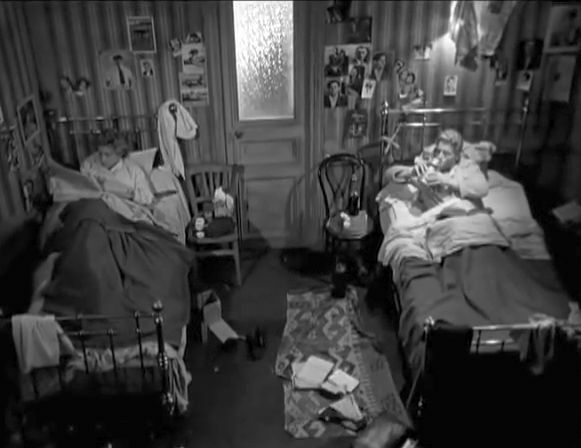 Paul’s friend Gerard takes him home to his apartment, where his sister Elisabeth is angry to learn that she now has to look after both Paul and their ill mother. A doctor arrives and after diagnosing Paul with a weak heart, orders him to stay home from school for the time being. That is fine with Elisabeth, because her main interest is to play “the game”, their fantasy dramas in which the two siblings express feigned resentment towards each other. They call this “getting lost” in the game. They also like to collect and keep in their “treasure chest” some weird, useless artifacts that have meaning only for their pseudo-narrative contexts. Watching them eagerly in all this is the solicitous Gerard, who is usually dismissed or scorned by Elisabeth but is still sometimes a prop in their games. During one of their rowdy dramas, Paul and Elisabeth happen to run into their sick mother’s room and discover that she has just passed away. Their mother’s death doesn’t evoke much emotion from the two of them, and it seems to be just another narrative event to add color to their lives. Incidentally, the doctor, along with all the other adults in this story, represents good-tempered responsibility and support. These are the kind of people who comfortably fit in well with the existing mature social framework. The doctor and Gerard’s obliging rich uncle arrange for them all to take a trip to the seaside. There the young people engage in more impudent naughtiness for its own sake, like stealing worthless (to them) objects from a local store or antagonizing small children. When they return to Paris, Elisabeth, now freed from looking after her mother, decides to get a job as a model at a couturier studio. By this point in the story, it is already evident that Gerard secretly loves Elisabeth, and Elisabeth secretly loves her brother Paul. At the fashion studio Elisabeth befriends fellow model Agathe and invites the girl to come live in her apartment. 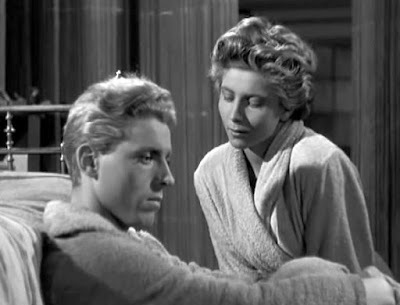 Upon meeting Agathe, Paul is disturbed to see how much the young woman looks like his schoolboy crush, Dargelos – (Melville having achieved this striking resemblance by casting Renée Cosima in both roles). And so Paul displays hostility towards Agathe. Elisabeth’s modeling activities lead her to meet a wealthy young American, Michael (Melvyn Martin). (The actor Melvyn Martin, by the way, was an American singer, and he composed the music and lyrics for the romantic song he sings to Elisabeth in the film .) In no time at all Michael proposes to and marries Elisabeth, and then he dies in a road accident the day after their wedding. Again, Elisabeth seems not to be very emotionally moved by the loss of her husband, and is more affected by the sudden dramatic change in her lifestyle and thus her life narrative. She is now a wealthy widow and owner of an 18-room mansion. With rooms to spare, Elisabeth invites Paul, Gerard, and Agathe to come and live together with her in her mansion. But soon her new wealth has become boring to her. She confesses to Paul that she finds the freedom of being rich leaving her in an empty void. She longs for the confinement and involvement of “getting lost” in their gameplay. That opportunity will soon arise. She convinces Paul that Agathe actually loves Gerard. She convinces Gerard that Agathe loves him. She then convinces Agathe that Gerard loves her and wants to marry her. Disturbed by what she has just done, Elisabeth looks at her hands with horror and tries to wash them – reminiscent of the “Out, damned spot” scene from Shakespeare's Macbeth. But she wants Paul all to herself. What elevates Les Enfants Terribles above the level of mindless solipsism is the way it explores and reveals, in admittedly exaggerated form, a fundamental problem that we all face: the search for authentic involvement with life. We abhor getting bogged down in the boring routines of the everyday, so we withdraw from those potential involvements in search of something more meaningful. And our exposure to culture brings to our attention the possibilities of our being involved in wonderful and exciting narratives. So we withdraw from the everyday and become isolated. This is the paradox. Elisabeth and Paul were educated, but their education led them to their isolation. And this is what is happening today. Although the paradoxical isolating process may have been accelerated with the advent of television, it seems to be even more magnified in the modern era of social media. These media are supposed to connect everyone, but instead we see many people withdrawing into their pseudo-narrative shells. And, as I mentioned earlier, for those who are guarded and worried about losing their exciting-narrative opportunities, the pseudo-narratives they most easily construct are based on hatred and resentment. Thus we now have the quasi-fascist Alt-right grouping in the US that spreads its resentment-filled pseudo-narratives via social media and fake news stories. This leads to segregation and mutual hostility, and it can also lead to people politically supporting bigoted demagogues whose simplistic pseudo-narratives cannot possibly accommodate the diversity that feeds a fruitful society. We need better social media that do not to keep us individually looking into “the cloud”, but instead help bring about more, and more meaningful, face-to-face interactions. Telling a tale such as this is not easy. There is the fundamental difficulty here of presenting an authentic drama (which inherently must be conveyed by role-playing) that is fundamentally about the dangers and false seductions of role-playing. We must have actors and a film director who can realistically present someone who is staging false theatrics and accomplish this by means of believable staged theatrics. In this respect I would say that Nicole Stéphane (in the role of Elisabeth) and Jean-Pierre Melville both succeeded brilliantly. Stéphane’s acting is one of the most entrancing screen performances I have seen. The film acting was effectively combined with three other key elements of the production to maintain a sense of affective interiority. Jean Cocteau’s voiceover narration sustained a level of reflective commentary on what happened. 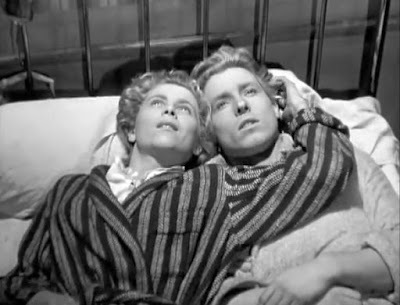 The nondiegetic music, featuring Bach’s “Concerto for Four Pianos” and Vivaldi’s “Concerto Grosso”, also cast an inward-directed mood over the film. And Melville’s atmospheric and dynamic expressionism – using variously (a) moody high- and low-angle shots, (b) contextually evocative tracking shots, and (c) dramatically appropriate camera-facing closeups – is beautifully implemented by cinematographer Henri Decaë. It all works perfectly to convey the feelings of narrative desperation. Gary Indiana, “Les enfants terribles: Hazards of a Snowball Fight”, The Criterion Collection, (9 July 2007). Neel Chaudhuri, “Into the Realms of Light and Darkness: Les Enfants terribles”, Cinémathèque Annotations on Film, Issue 39, Senses of Cinema, (5 May 2006). Kevin Jackson, “Enfant Terrible, Jean Cocteau: A Life By Claude Arnaud”, Literary Review, (6 December 2016). Variety Staff, “Review: ‘Les Enfants Terribles’”, Variety, (31 December 1949).